Finally…it’s fall! 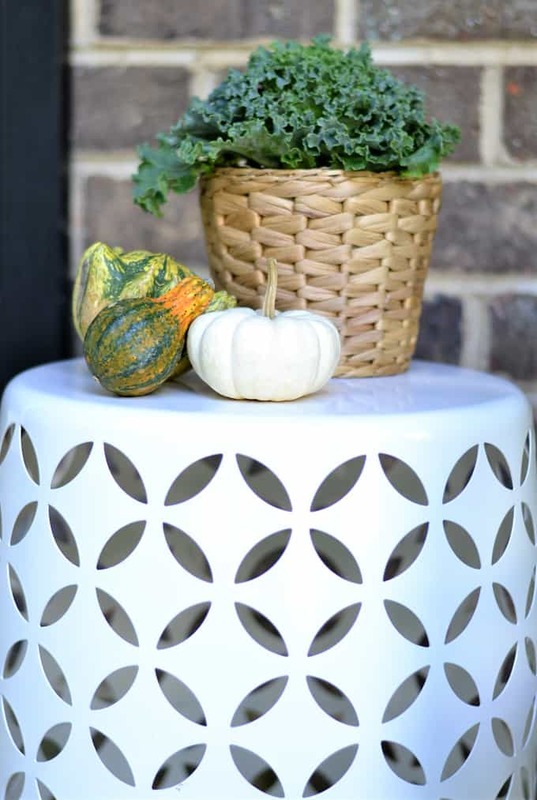 One of my favorite parts of any new season is decorating my front porch with on-trend finds sure to welcome my guests in style. 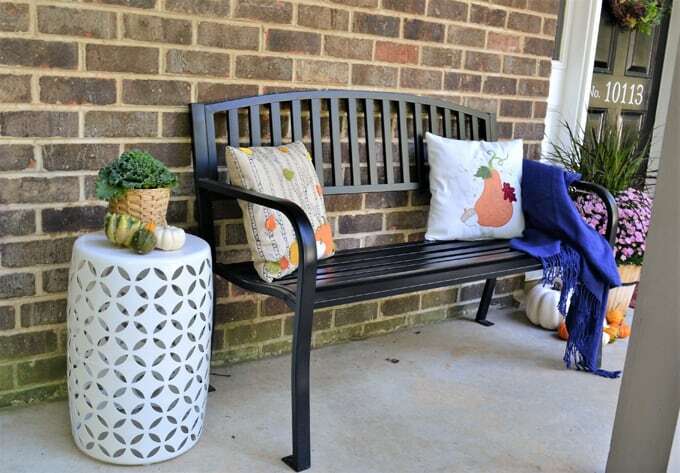 Over the weekend, my husband and I made a stop at Lowe’s, where we had so much fun putting together a new look for our porch with their selection of Fall decor products! 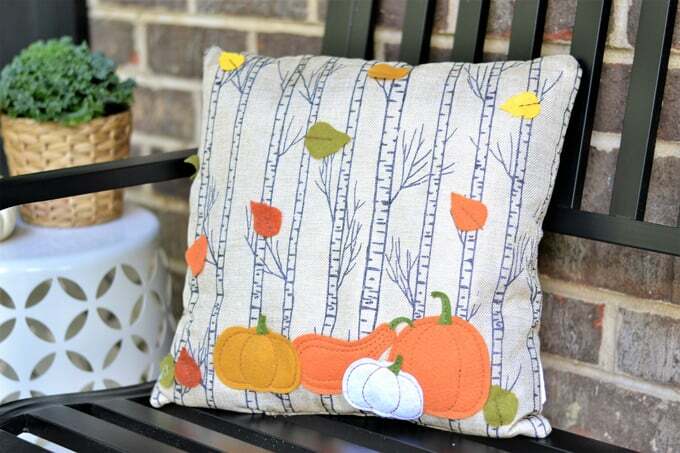 Lowe’s has a wide selection of Fall (and Halloween) themed decor items at fantastic prices. We were able to pick up almost everything you see in these pictures at Lowe’s, for probably less than you’d imagine. The next few images are shoppable (YES! ), so just move your mouse over the image and click the numbers to be taken to the Lowe’s site so you can purchase the items yourself! 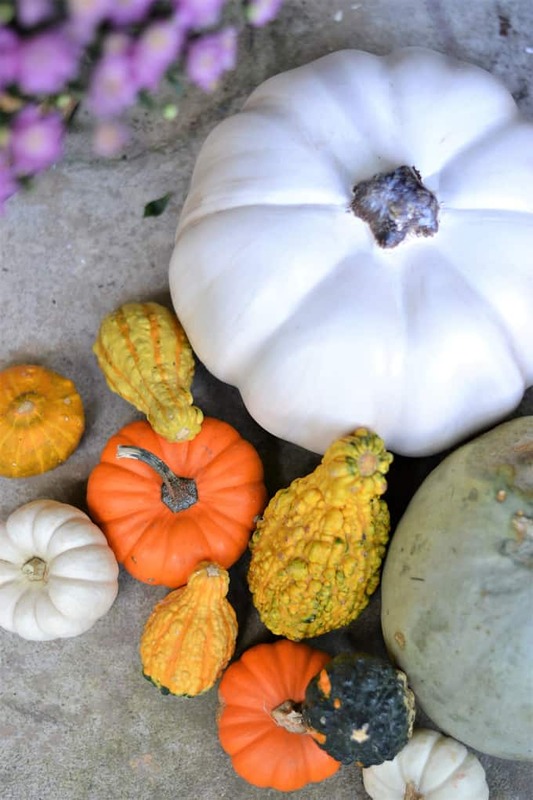 Lowe’s had a large selection of pumpkins and gourds (both real and fake), pillows, door mats, plants, plant stands, benches and more to add budget-friendly curb appeal to your home. I chose to go with a fall theme, but if you love Halloween, there’s plenty of decor to choose from, from spooky to silly and everything in between. Almost everything you see in this photo is from Lowe’s (we actually have another of those metal plant stands in navy). 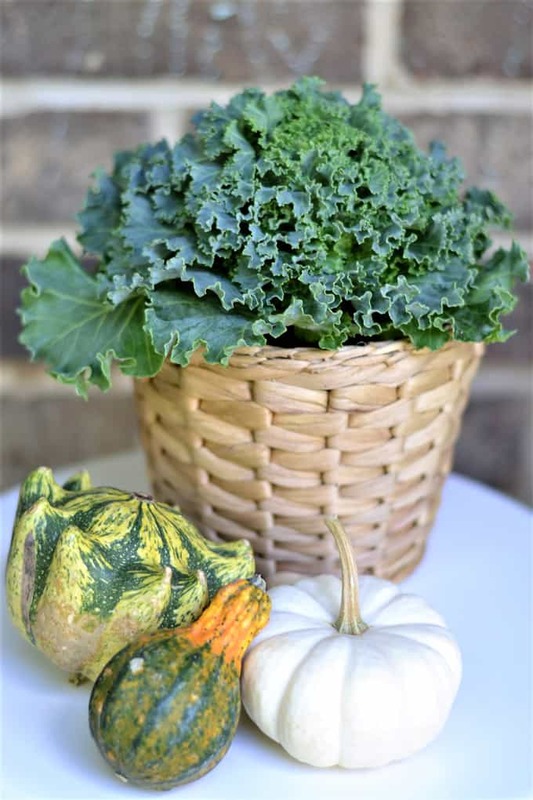 It’s perfect for outdoor use, and looks great topped with a plant (this one is an ornamental kale plant) and a few gourds! On either side of our front door, we have two gorgeous mums with ornamental grasses. There were several colors/varieties to choose from in our store. We also found this “thankful and blessed” doormat (which I can’t find online, but there are other fall doormats to choose from here). 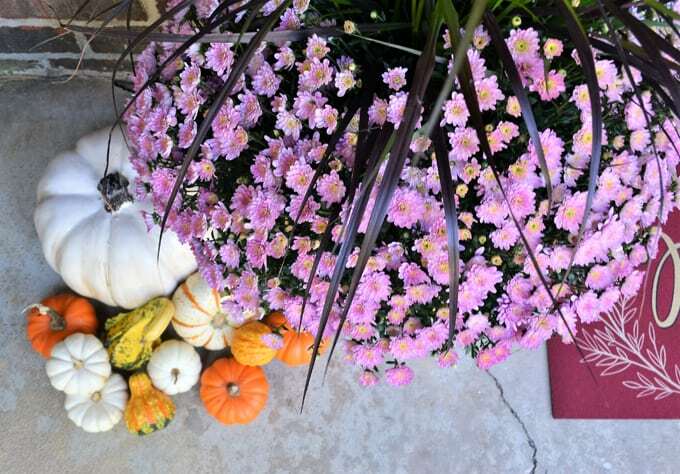 In front of each mum, we added an assortment of pumpkins and gourds for more fall color and texture. I combined both real and faux elements, in different colors for a fun, eclectic look. I love how welcoming our front porch is now! With the help of Lowe’s, we’ve upped our curb appeal and are ready to welcome all that fall has to offer. 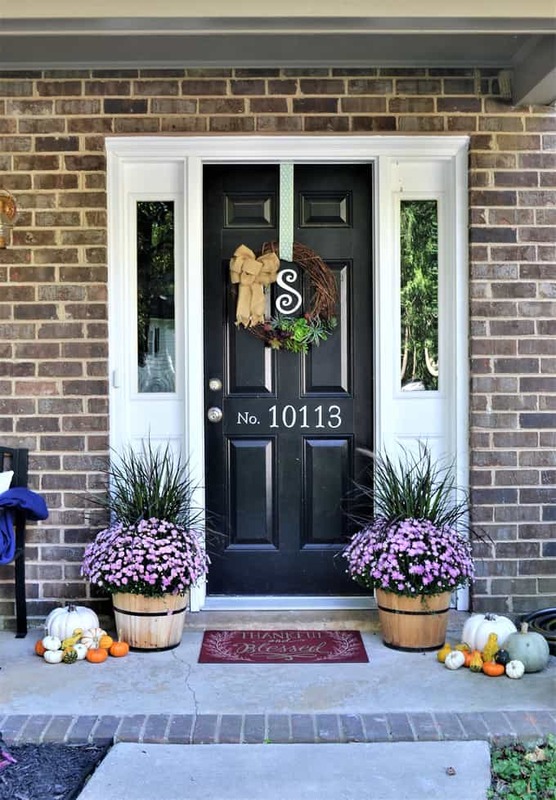 What are your favorite tips and tricks for getting your front porch ready for fall? 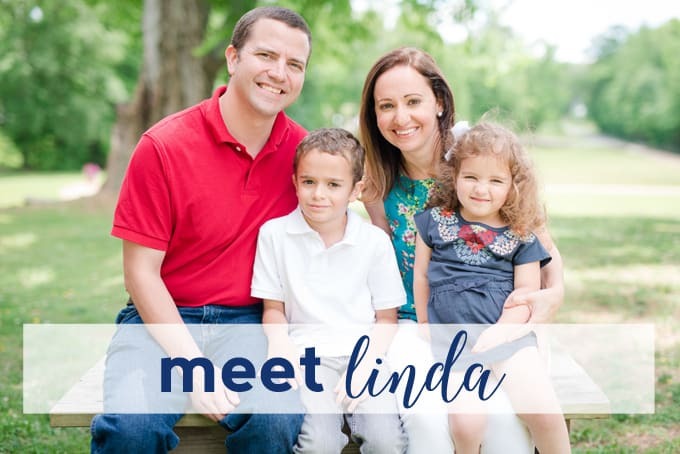 Leave a comment; I’d love to hear! 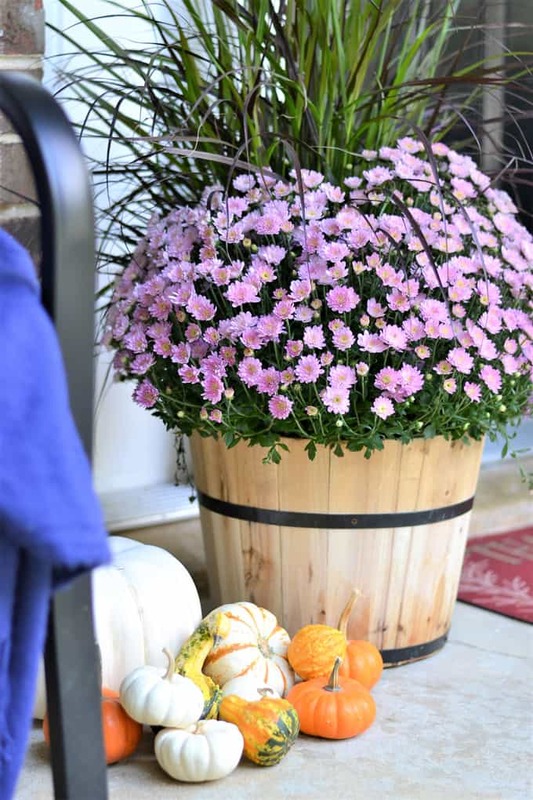 Thanks for reading all about my easy fall porch decorating tips! Have a great day! What an inviting porch! Love the rug! Sharing on G+ Thank you for linking up to Merry Monday! Hope to see ya next week! I love your fall décor. I love the pillows and the wreath. Thanks for sharing on Sunday’s Best. 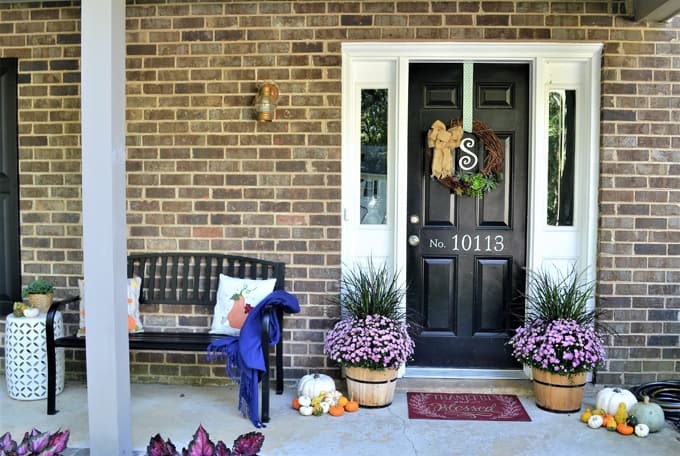 Your porch looks perfect for the fall season! I love the mums and gourds you chose. Thanks for sharing with Merry Monday – I’ll be featuring your porch decorations at our upcoming party! Hope you’ll stop by and link up again. Looks great! Sharing! Thank you for sharing on Merry Monday! Hope to see ya next week! Your porch looks wonderfully welcoming! I love your mix of pumpkins, gourds and mums. And those pillows are so cute, too! Thank you for sharing your porch at our Merry Monday party. I’m going to include it in my Party Features for this coming week. We hope you’ll be able to stop by and link up again!